A programmable realtime clock that can be used to show time/day-dependent content. Use this Stack to add a clock with date and/or time to your web page, and optionally show a message or Stacks of your choosing at a specific time each day. For example, you can use this Stack to show whether your help desk or storefront is open or closed. Update: set a time zone so that people around the world see your time. 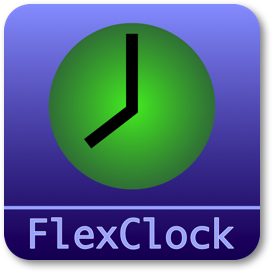 The FlexClock Stack has options to control the appearance of the clock, including 12/24hr format, seconds, date, as well as styling options such as font, size, and color. Additionally, each day has an option for customizing Stacks that will be shown within a specified time range, and outside that time range. Text color Default color of time and date text when custom day/hour coloring is not enabled or active (see below). Font family Choose a font for the time text, or select Other and provide your own font. Other font Select another font to use for the clock text. Alignment Locate the time/date text within its div. Client local time Check this to show the date and time using the client's computer, and not in a fixed time zone. Uncheck this option to show date and time for a specific time zone that you choose below. Time zone offset Select a time zone offset from GMT (Zulu) time. When this option is enabled the time shown will be different on browsers around the world, but will represent the one selected time zone. Daylight savings is not supported, so manual selection is required. Show time Check this to show time above the date if any. Time scaling Scale time text using Ems. 1.0 is default. Bold text Check this to enable bold font. Show seconds Check this to show seconds on the clock. Flash seconds Check this to flash the : on and off every other second. 24hr military format Enable this to show time as 0:00 - 23:59. Disable this to show time as 12hr AM/PM. AM/PM strings Select the style of AM/PM strings that follow non-military time. This is am/pm with or without a blank space separating it from the time. Uppercase can be set with the option below. Uppercase time Check this to uppercase the time string (AM/PM portion), except for the suffix if any. Time suffix Add text immediately after the time. Useful for appending a time zone, or other text. You may wish to add a space to the start of this entry. Show date Check this to show optional day and date, below the time if enabled. Show day Select any value other than No, to show the day name before the date string. Days default to English names but you may customize to any language using the Rename day options below. The Edit preview area will not reflect the actual Renamed day when abbreviated 3-letter days are chosen, as Monday is the default, but Preview and Publish will work. Day separator Select the separator between the day and the date. Usually this is a comma, as Monday, July 25, 2016. Date format Select the format of the date string such as January 1, 2015 or 01/01/2015, etc. The default is to allow the client to set this, based on locale. *As the client determines locale settings, the format is not predictable - an example is shown. Date delimiter Select the delimiter for date formats such as 01/01/2015 selected above. Date scaling Scale date text using Ems. 1.0 is default. Date padding Set the vertical padding/spacing between time and date text in pixels. This is ignored if time is disabled since it is only required to space date away from time. Uppercase date Check this to uppercase the entire date string (date plus optional day), except for the suffix if any. Date suffix Add text immediately after the date. Useful for appending a time zone, or other text. You may wish to add a space to the start of this entry. Responsive? 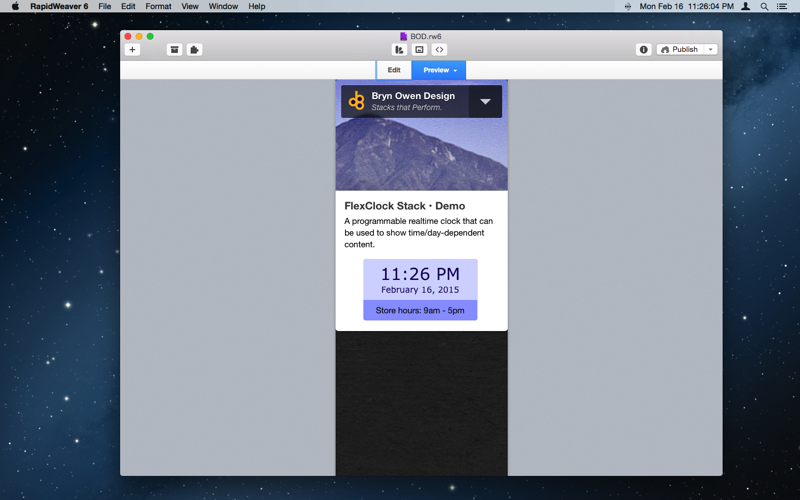 Check this to enable responsive styling features. This enables various styling changes when the client width is smaller than the width selected below, such as the case for mobile. 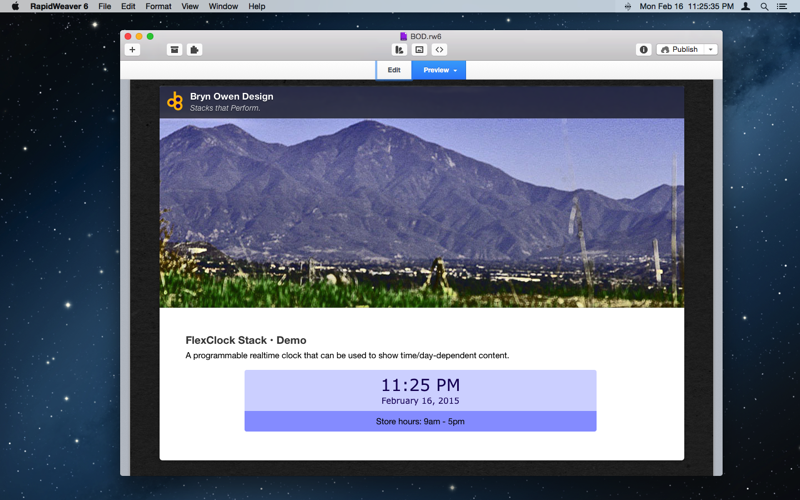 Use these features to resize the time and date, or optionally disable the date altogether. Responsive width Client width below which responsive behaviour begins. Time scaling Scale time on smaller client widths such as mobile. Value is in em. Has no effect if date is disabled. Disable date Check this to disable the date for smaller client widths such as mobile. Only has an effect when date has been enabled above. Date scaling Scale date on smaller client widths such as mobile. Value is in em. Has no effect if date is disabled. Date padding Set the vertical padding/spacing between time and date for smaller client widths such as mobile. Has no effect if date is disabled. Disable stacks Check this to disable the customized daily Stacks, leaving only the time or date for smaller client widths. Rename day Enter a custom name to replace the default Sunday. Customize Sunday? Enable this to color the clock text with a custom color on this particular day, or between specified times on this day. Optionally display a stack if enabled below. Color Color of time and date text on this day and optionally between the times specified. Start time Start custom formatting at this time. Time format is HH:MM in 24-hour format. Blank is the start of day 00:00. Stop time Stop custom formatting at this time. Time format is HH:MM in 24-hour format. Blank is the end of day 23:59. Add a stack Enable this to provide a slot for a custom stack that will appear during the time period above. Spacing to date or text is controlled by Stack Padding below. Opposite stack Enable this to provide a slot for a custom stack that will appear outside the time period above. Spacing to date or text is controlled by Stack Padding below. Rename day Enter a custom name to replace the default Monday. Customize Monday? Enable this to color the clock text with a custom color on this particular day, or between specified times on this day. Optionally display a stack if enabled below. Rename day Enter a custom name to replace the default Tuesday. Customize Tuesday? Enable this to color the clock text with a custom color on this particular day, or between specified times on this day. Optionally display a stack if enabled below. Rename day Enter a custom name to replace the default Wednesday. Customize Wednesday? Enable this to color the clock text with a custom color on this particular day, or between specified times on this day. Optionally display a stack if enabled below. Rename day Enter a custom name to replace the default Thursday. Customize Thursday? Enable this to color the clock text with a custom color on this particular day, or between specified times on this day. Optionally display a stack if enabled below. Rename day Enter a custom name to replace the default Friday. Customize Friday? 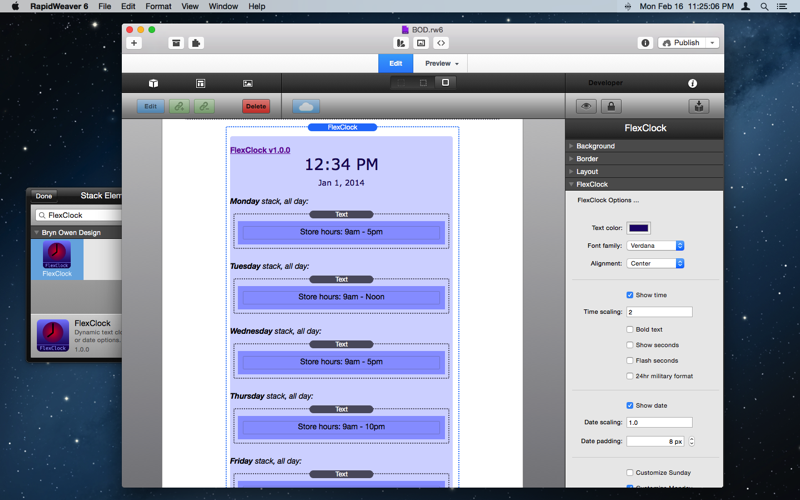 Enable this to color the clock text with a custom color on this particular day, or between specified times on this day. Optionally display a stack if enabled below. Rename day Enter a custom name to replace the default Saturday. Customize Saturday? Enable this to color the clock text with a custom color on this particular day, or between specified times on this day. Optionally display a stack if enabled below. Stack padding Set the vertical padding/spacing between date text and any custom stack in pixels. This is ignored if date and time are disabled since it is only required to space date away from them. It is Sunday in California! It is Monday in California! It is Tuesday in California! It is Wednesday in California! It is Thursday in California! It is Friday in California! It is Saturday in California!